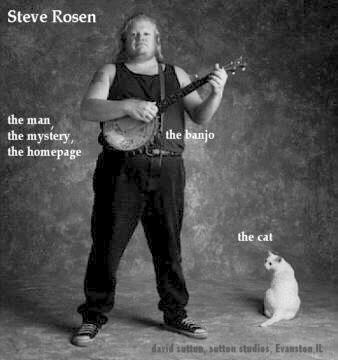 .....to the semi-official Volo Bogtrotters Homepage, as well as the internet home of Banjo player Steve Rosen! you are visitor number to be bored enough to visit my site! Welcome to my world! What are you doing here? Are my life and music that interesting? Whaddya want to know? ....and when you find out, leave me a little note in my new Guest Book! NAIL THAT CATFISH T-SHIRTS are available again! get 'em while they're hot! And I made a page with some recordings and info about the tune, NAIL THAT CATFISH, so if anyone wants to hear the tune from the horses mouth. i mean the horses fiddle. I like to go places and write things. Here is My New Blog from Florida. I went to Prague and ate some stuff. Perhaps you'd like to see my short travelogue of it? Prague Food tour. Here's a little tale of sunny Mexico and the bullfight we saw. NEW! 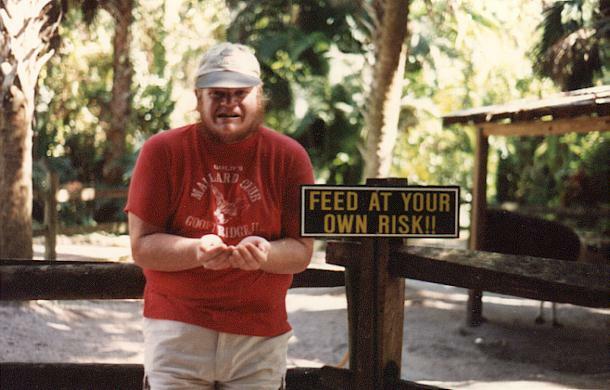 Pictures of me as a youngster. I just returned from Australia! and will have a picture page running soon....I just know you can't wait.I did search for my family roots, and learned a lot! Perhaps you heard about my band of 30 plus years, The Volo Bogtrotters? We just released our fourth recording, our first CD, and it's great! Wanna hear a little clip? See some pictures? I'm sure word has reached you concerning the Whiskey Hollow Bluegrass Band, Chicago's premier Band with that name. See our professionally made portrait and get the stats on this crew of misfits. The Chicago Cajun Aces are playing traditional Cajun music from southwest Louisiana for some great dance parties! A list of upcoming events for the Volos, Whiskey Hollow, and other of my musical concerns. I play for dances with the Chicago Barn Dance Company. The finest fiddlers and hottest old time musicians play there regularly. Get the lowdown on the hoedown and the schedule of events. Be there! I went to France with the Wild Goose Chase Cloggers...and for 20 years now I've been meaning to post pictures and stories. And now that it's 2017, i have no idea where the pictures are, though i still remember a lot of it like it was yesterday. All of it recorded on VHS tape. So there's one good picture there. I have my very own CHAT ROOM!, but unless we make a date, you'll probably be in my room all alone. Don't go through my stuff!!!! You wanna get personal? Why? Well...whatever floats your boat. Here's a page full of Train Pictures for the serious railfan. Cats are cool. So are dogs, but I don't have any. Here's some photos that defy categorization. Tell me what you think.Email me or SIGN MY GUESTBOOK!